Your passport to a new world of music. Guitar Method or Supplement; Method/Instruction. National Guitar Workshop Book, Approved Curriculum. Instructional and Method. Instructional book and examples CD. With standard guitar notation, guitar tablature and instructional text. 48 pages. Alfred Music #00-26073. Published by Alfred Music (AP.26073). ISBN 0739043021. 9x12 inches. English. The music of Italy is known for its lively rhythms and emotional melodies. This rich tradition of Italian music has been under-represented in the "world music" genre - until now! Each chapter in this book focuses on a particular region of Italy. Readers learn the history, cultural influences, and instruments of each area. While some of the songs featured were originally performed on instruments such as flute, mandolin, or bagpipes, they appear as guitar arrangements for the first time here. The book covers both fingerstyle and pick playing, and explores special techniques such as grace notes, hammer-ons, pull-offs, and tremolo, to help guitarists pick up all the nuances of style. 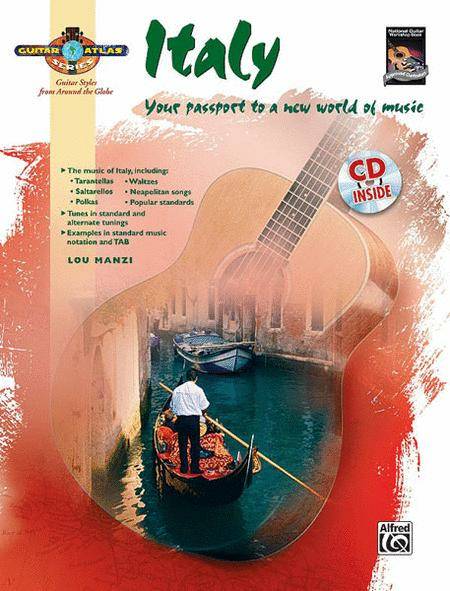 Tips for playing accompaniments to Italian songs are included, and some of the tunes feature a second guitar part perfect for duets! With this wealth of material, everyone from beginners to advanced players can learn to master this culturally rich music. Compositions are written in both standard music notation and TAB. A CD demonstrating all the examples and compositions featured in the book is included.